I expected Moto Moto to be more gadgety, maybe more scientific. The website doesn’t really reflect how comical and playful their food is. It was fun and almost childish, allowing adults to play with our food. 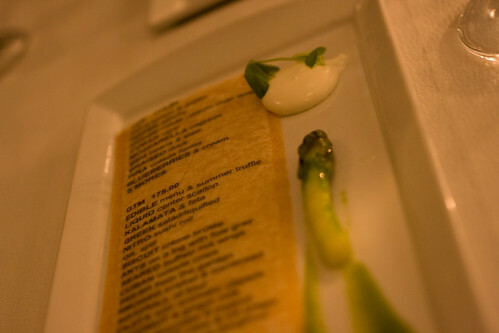 Right from the beginning, your menu is presented on an edible butter cracker with a dollop of marscapone, a perfectly cooked asparagus, and asparagus puree. The cracker was too salty for me but so fun to eat. We chose the ten course (as opposed to the 20 course) because 3 hours is really long enough and I think they mixed in a couple of things from the other menu for us. Let me apologize now for how bad the photos came out. I’m still a very amateur photographer and the lighting was dim, and the candlelight kept flickering. The first course was the Liquid Center Scallop (can’t remember what the liquid was now) which came with a carbonated lemon half. Citrus and seafood, always a good match. 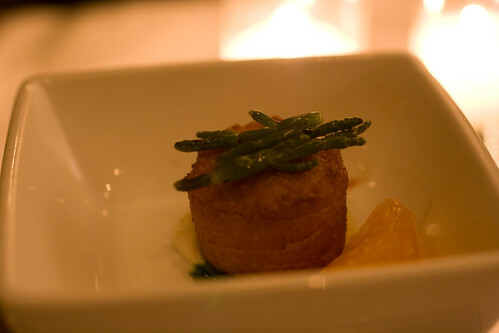 The texture of the scallop was interesting to me, reminiscent of Asian fish cake, a soft smooth one. 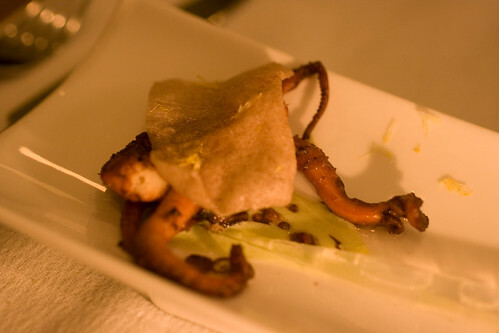 The Octopus was very tender, extra meaty, but a tad stringy. 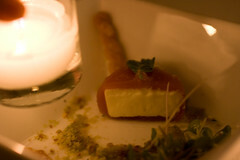 It was served with a little dropper filled with liquified greek salad. It tasted exactly like tomatoes, cucumbers, vinegar and oil, light and refreshing. The House Made Chile Pequin Quail was a gourmet take on buffalo wings, the ultimate perfection of the concept, making this one boneless, ultra juicy, quality poultry. I savored each bite with little pieces of celery and carrot, making well rounded mouthfuls. I wished for more. 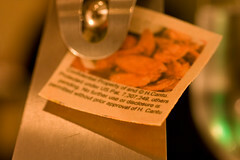 The little info tag tasted of the same spices. 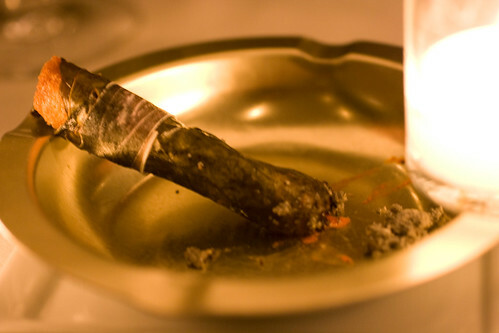 The Cuban Cigar was where it started to get deceptive. I felt like Alice in Wonderland as I ate out of an ash tray. The tender pulled pork wrapped in thin crispy collard greens (texture was almost like nori) was a little smoky, impressing me with their wit. 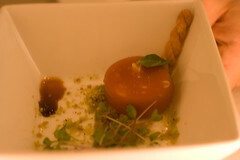 The Mozzarella Caprese was fresh, soft, and milky mozzarella encased in a tomato gel. I wish the tomato gel had a stronger flavor to match the great cheese. 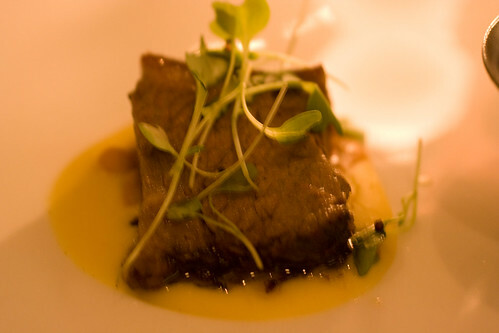 The Beef Brisket melted in your mouth, was not greasy, and sat on wonderful beans. The slaw, frozen in liquid nitrogen, was a little weird for me because it was like slaw flavored sorbet strings. 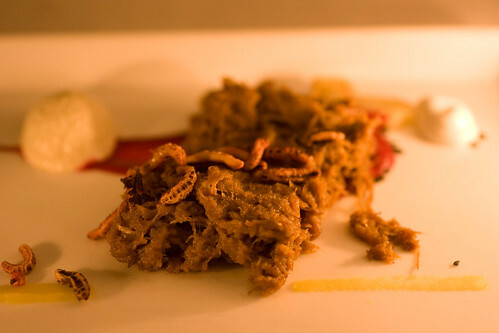 Road Kill was a test of stomach strength, eating meat with maggots made of rice, seeing the smear of blood (beets), and the brain (made of mushroom puree). Lon loved this dish (and licked it clean) but this was the only one I couldn’t really eat. The meat seemed like sauced formerly dry meat, overly spiced (heavy ginger), and the mushroom brain was uber strong too and we ddin’t know not to eat so much at once. 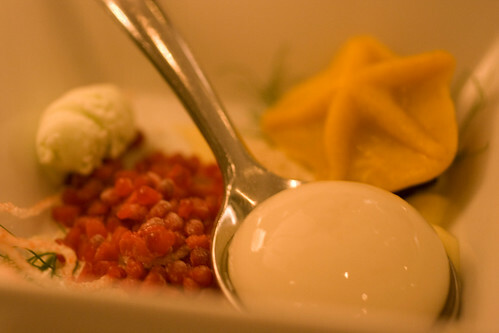 The palette cleanser was scenic beach set up, with an edamame ice cream, a star fish made of apple puree, frozen raspberry rocks (that rocked), and a liquid ball of lightly curried coconut liquid. 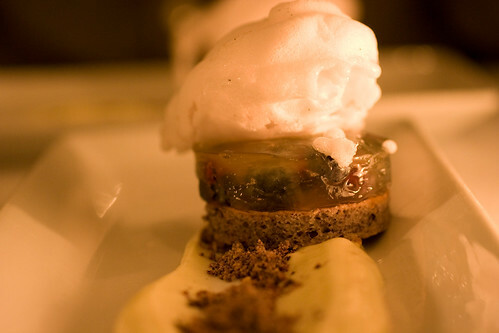 The first dessert was blueberries suspended in a yuzu gelee, a bit of cake underneath, and a foam on top. It was light with interesting textures, but not spectacular had it not been for the ultra fresh scent of yuzu. Seems like Chocolate is always the way to end. 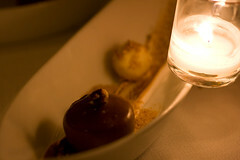 This boat shaped dish caught everyones’ eye, filled with deconstructed s’mores. A smear of marshmellow is topped with a chocolcate shell with a liquid caramel center, a teeny chocolate cake, and a popcorn ball. We were told to break the chocolate and let the caramel leak out forming a river of flavors. The popcorn ball was to be eaten last whole. The popcorn flavored liquid that gushed out was disgusting but after that was gone, you get the sensation of popping in your mouth for quite some time, kinda like pop rocks. 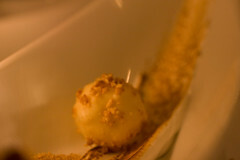 e one at Alinea. For me, although Moto has a completely different feel, it was a similar experience in that I only really loved 3 dishes (quail buffalo wing, beef brisket, coconut palette cleanser). The rest was mostly pretty good, but also pretty regular in flavor to me. I did enjoy the experience though. It’s new, exciting, fun, and witty, and gives you a glimpse of the chef’s personality. On a side note, the restaurant is located in what seems like the meat packing district. As you walk in and out, it smells like rotting meat, which isn’t very appetizing. posted by jessica	at 12:47 AM	Filed under Fusion or Mixed, Restaurants, Travel. You can follow any responses to this entry through the RSS 2.0 feed. Both comments and pings are currently closed. 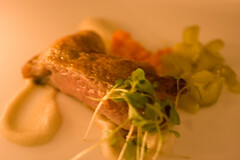 I love to hear peoples’ reactions to an experimental cuisine restaurant. The road kill was too much. My boyfriend would have thought that was the most genius thing. Moto really pushes the limits with that dish…in a good way. But a chef still needs to be aware of harmonizing. It seemed a little lacking (in finesse and taste) …Maybe he is just having too much fun making his customers cringe, laugh and delight. Manger la ville, Lon really loved that dish and I really didn’t so it’s hard to say.